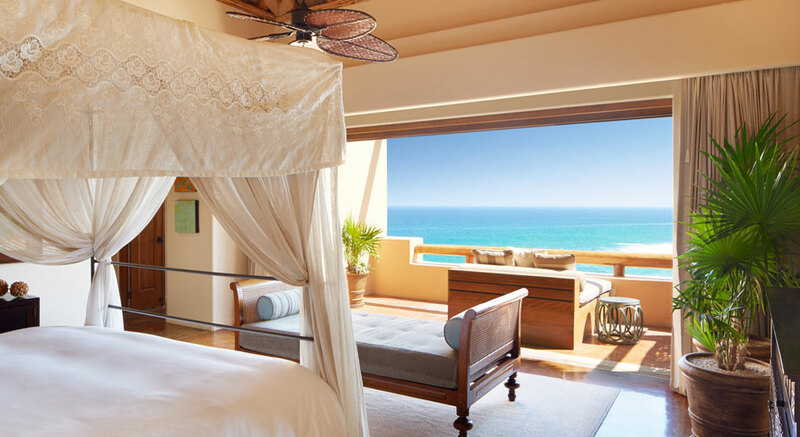 The Esperanza Resort is an oceanfront resort perched on the bluffs of Punta Ballena (“Whale Point”) overlooking two private coves on the majestic Sea of Cortez. The resort is situated a short 10-minute drive from Cabo San Lucas and 30 minutes from the historic colonial town of San Jose del Cabo and San Jose del Cabo International Airport, which services many major U.S. cities. As a member of the prestigious Relais & Châteaux collection, Esperanza is a Virtuoso favorite. The hotel has 57 casitas and suites, 60 privately owned villas and 36 private residences providing residential accommodations for families and groups. Accommodations range from one to four bedrooms and from 925 to 4,000 square feet. Interiors showcase a regional seaside design with original art; handcrafted furnishings; large private terraces with infinity edge hot tubs; and spacious bathrooms with deep soaking tubs and showers built for two. In-room amenities include flat-screen televisions; complimentary high-speed wireless Internet access; iPod docking stations; all-natural rubber Harmony™ yoga mats, and Esperanza’s signature in-room bath amenities made with natural essential oils, organic vegetable oils and pure fruit ingredients. Rates quoted are tax inclusive. Be sure to ask about additional Virtuoso amenities, available only to our valued clientele. Cocina del Mar: known for its exquisite variety of fresh fish and seafood specialties. It utilizes only the freshest possible ingredients, offering a spectacular and unusual presentation. Inspired by the wide selection of food that the coasts of the American continent offers and the international experience of the “Cocina del Mar” culinary team. The executive Chef born in Argentina offers cuisine that covers several styles and traditions of North, Central and South America, utilizing contemporary and creative techniques. A three and four course menu is offered, considering always vegetarian and vegan options. La Palapa: located at the Residence Club offers casual outdoor dining with authentic Mexican food with amazing views, an exhibition kitchen and swim up bar, serving lunch and dinner daily. La Terraza Americana: features light fare and traditional American cuisine including salads, sandwiches and burgers, all served in a casual outdoor setting. Open for lunch daily. The Lounge Bar & Humidor: Directly overlooking the ocean’s edge with a beautiful view of Cabo San Lucas’ famous Land’s End. This cantina serves a variety of appetizers and light meals in addition to specialty cocktails. In the evening, entertainment compliments an extensive tequila and cigar menu. Las Estrellas: Located in Auberge Private Residences at Esperanza, Las Estrellas ia a casual, family friendly Italian restaurant highlighting our pizzas and homemade bruschettas. Esperanza offers spectacular settings for the perfect wedding occasion. Ask us for more information. Fully-loaded iPods are available for complementary use, with an option to purchase. Complimentary yoga classes are offered daily in the resort’s 1,000 square-foot yoga studio. All rooms feature complimentary in-room yoga mats and fitness DVDs. An Auberge Spa, the award-winning The Spa at Esperanza incorporates the elements of water, light, desert and sea. The spa offers a wide variety of pampering, restorative and wellness treatments and fitness conditioning. A full-service fitness facility with state-of-the-art equipment, including cardiovascular machines, elliptical cross-trainers, stationary bikes, free weights and more. Fitness specialists are available for personal training and private consultation. Children are not permitted at Esperanza, however there is a villa seperate from the resort area that does allow families. As pricing changes with season and package availability, please ask us for the latest depending upon your travel dates.